I arrived in London on Friday afternoon, experience from the past having told me that reliable train times and the British rail network do not fit together hand in hand, not a good thing when an event starts in the morning – true to form, Network Rail didn’t disappoint, with 2 completely separately delayed trains. 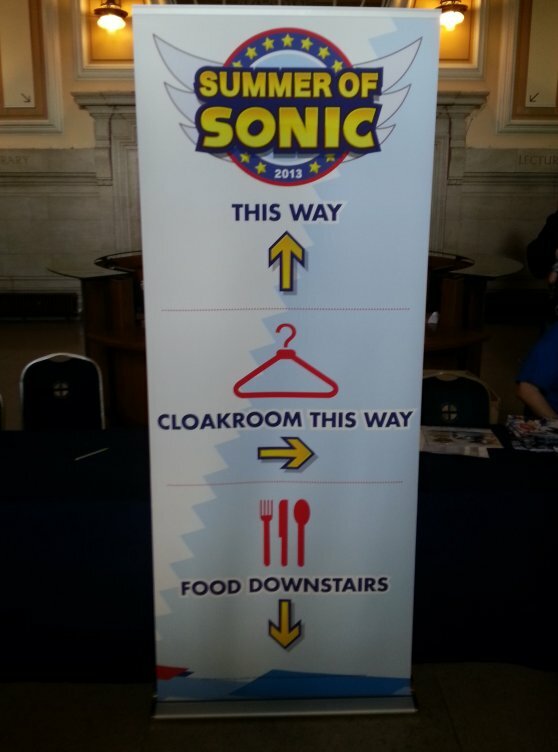 Once in London and having checked into the hotel, I killed a bit of time before the rest of the group from Sonic Retro started arriving by heading down to where the venue was and finding it beforehand. 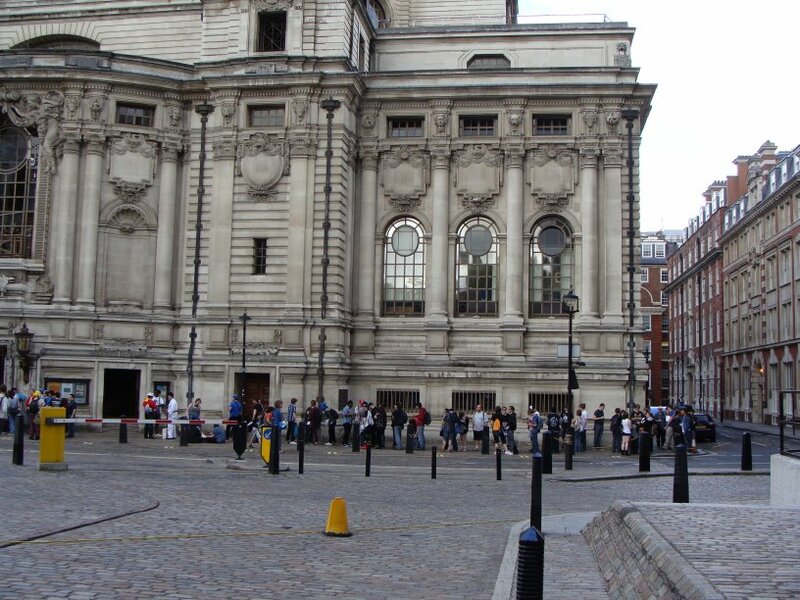 This year the site was the Methodist Central Hall in Westminster, right in the heart of London – not 5 minutes walk from the place are sites like the Houses of Parliament, Westminster Abbey and Downing Street. After playing tourist for a bit (and seeing a man hop in a circle on one foot to Irish folk music, whilst holding up a sign proclaiming the imminence of World War 3 – only in London), I headed off to the pub as others started to arrive, where we planned out the following day’s activities. Saturday dawned, and we all assembled in the queue for the show, StreetPass Miis flying through the air all around us. One of my favourite things about Summer of Sonic is the fact that you have so many people from the community in one spot – even Retro’s own Barcade runs can’t compare to the draw that SoS has, and it’s always great seeing so many familiar faces again. We waited for the opening while clearing out Mii encounters (a running theme throughout the day), and finally got inside, immediately making a bee-line for the Lost World demo pods, in the main room of the show. While waiting for the game, we checked out the goodie bags we’d been given on the way in – inside was one of the Sonic head hats from the 20th anniversary (see how many you can spot in SoS crowd pictures), a 75% off voucher for Sonic & All-Stars Racing Transformed, and the biggest surprise in the bag – an actual printed issue of Sonic the Comic from the STC-O guys, the first printed issue of the mag since 2002, done specially for the comic’s 20th anniversary. StC was a sizeable chunk of my childhood so this was a fantastic surprise, and I know that most of the attendees at the show will have felt the same way. There were three Wii U pods running the Comicon build of the game, with 4 levels available; and six 3DS units running the hand-held version of the game. For further impressions on those, there’s a separate article coming out soon; but what I will say here is the line for the Wii U version was much longer than the 3DS queue, though still a very manageable length. We started queueing and all 8 of us were done inside an hour, nowhere near 2010’s Sonic Colours queue. This was the first mainline Sonic title without a public demo available beforehand since that show, and this major test was passed, kudos! Someone joked on the #summerofsonic Twitter feed (shown on TVs around the event, along with the livestream video) that there were more people in the Wii U queue than actual Wii U owners. The 3DS queue on the other hand was near non-existent (though it wasn’t initially clear where it was, probably due to the lack of queue) – I took advantage of this later in the day to play Windy Hill 1 on the 3DS, following my earlier play of Desert Ruins 2 on Wii U. Meanwhile, the activities on stage were getting under way, with a Sonic Paradox animation of Marine the Racoon and Tails Doll gently prodding a few jabs at the community and introducing the show. The usual Never Mind the Buzzbombers took place, with T-Bird claiming the victory this time (hard luck Rory, maybe next year? ), and the Retro group migrated next door, where the merch stand was plying their trade and the signing desk was waiting for the arrival of the first guest of the day, Takashi Iizuka, so we joined the line – I got my Generations manual signed. We then moved back into the main room again for Hoshino’s Q&A session. As he hasn’t been to SoS before, almost everything was new ground, and this proved to be very interesting. 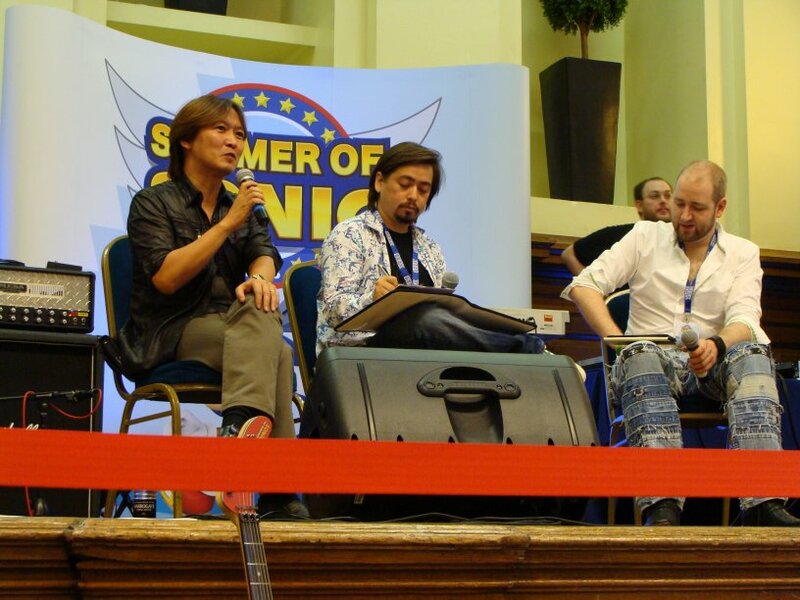 Hoshino-san answered a variety of questions on topics from original designs for Amy Rose & Metal Sonic, the hidden images on Sonic CD such as the human-esque “Sonic with Muscles” (which he said most of the dev team made an image each for inclusion in the game, this particular one being inspired by American comic book heroes), and Tails Doll and Metal Knuckles from Sonic R (who he revealed were intended originally as one-off gimmicks). 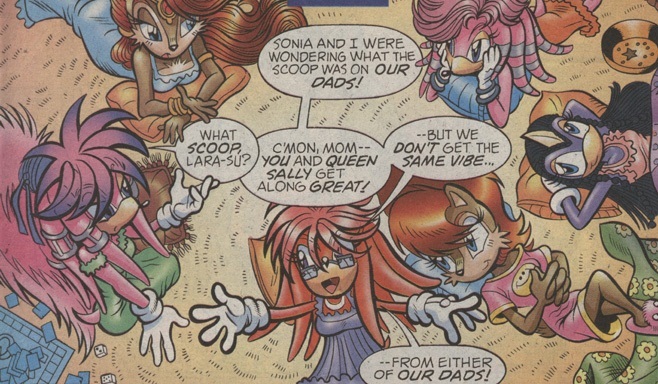 Rory also took the chance to ask him if he’d heard about the community meme around Tails Doll’s demonic powers, which he seemed to find amusing. 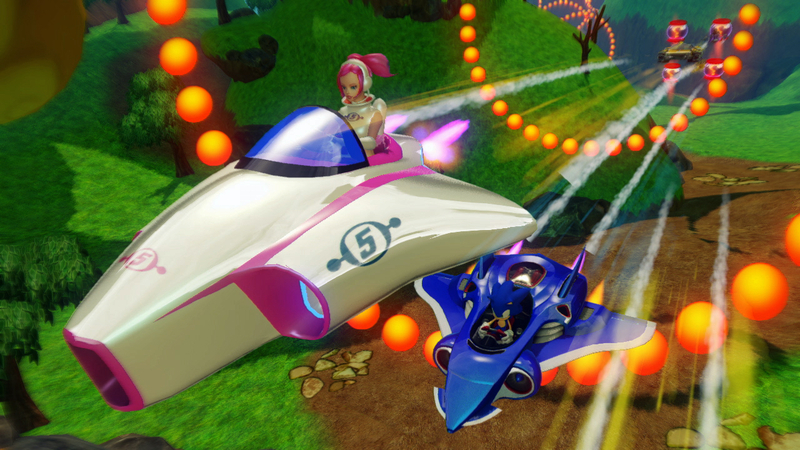 Finally, he also chatted about some of his non-Sonic work, such as Burning Rangers and NiGHTs. 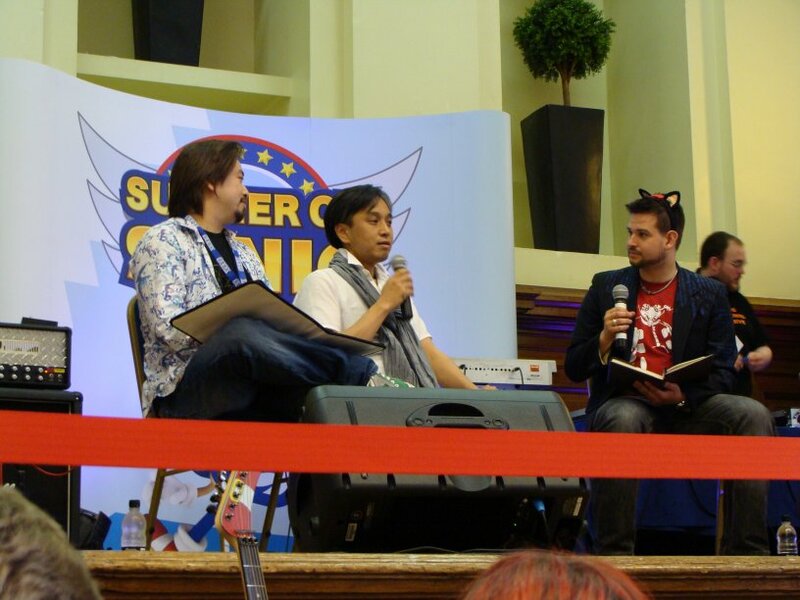 Right on the tail of Hoshino’s Q&A was Iizuka-san’s – unsurprisingly, Sonic Lost World featured highly on the agenda, with Iizuka discussing the Deadly Six’s inspiration (Japanese oni, hence why they all have horns) and confirming once again that Sonic X-treme wasn’t really thought about during development of the game. 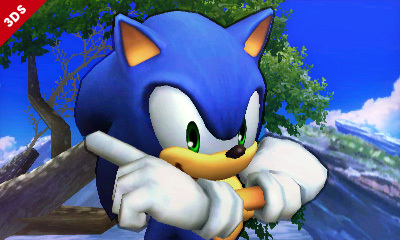 He also revealed that there’s something extra available for those with both the 3DS and Wii U versions of Sonic Lost World, but didn’t say what – one to look out for around launch… Asked what his favourite thing about Summer of Sonic was (having been to a few of the events now), Iizuka said that “It’s run for the fans, by the fans” – something which got a large round of applause. As soon as the Iizuka Q&A was over, we headed next door for Hoshino-san’s signing session. 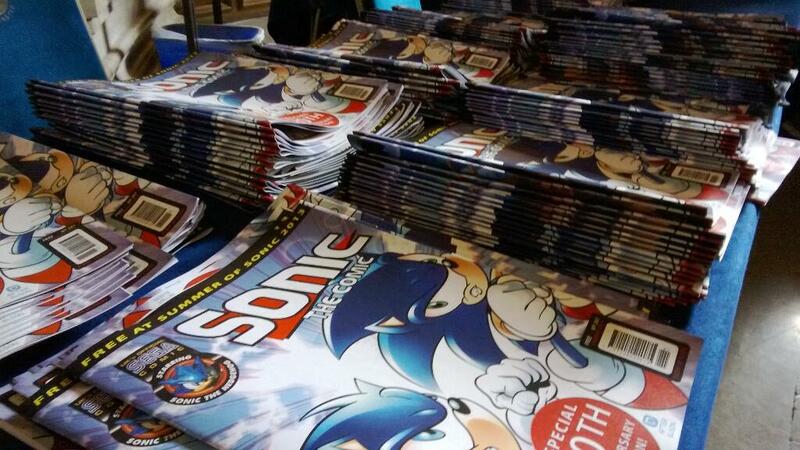 I joked to some of the others that this was probably the most copies of the Mega CD version of Sonic CD in one spot since 1993, there were so many copies of the manual & cover for the game about (Retro alone had at least 3!) Having finally snagged a copy of the game on eBay less than a week earlier after trying on and off to get one for some time (and always being outbid at the last second), having my new acquisition signed makes plugging this hole in my games collection that little bit sweeter. While we were waiting, the screens aired a surprise – Sonic Paradox’s Sonic Shorts 8, which I look forward to seeing again when it’s put online (also, if I can digress for a second – how about putting up the one you did for SoS 2012, guys? Would be awesome to see that again). We then retired to the cafeteria for a bit to rest and get some space from the masses in the main halls, before the final event of the day started, the music set – however there was one final surprise first for Svend, who after being one of the main organisers for the last 5 Summer of Sonic events stepped down this year. 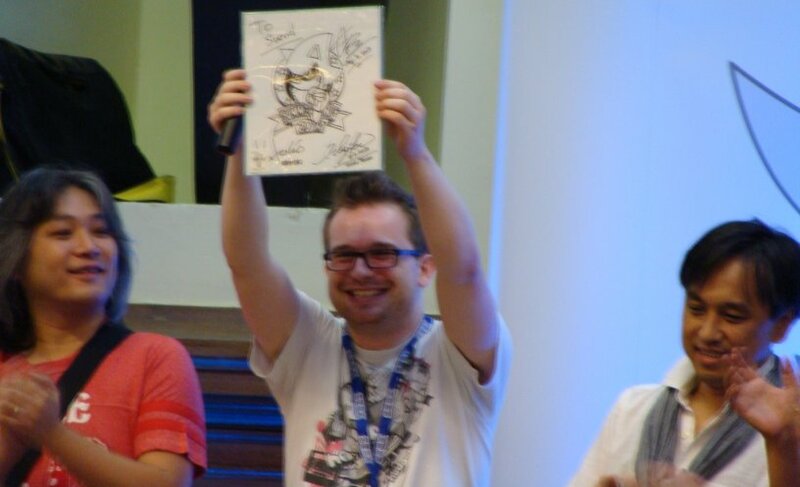 On stage, he was thanked by the crew for all his help over the years, being presented not only with a Summer of Sonic cake but a signed picture of Metal Sonic drawn by Hoshino-san himself. Closing out the show once again was Jun Senoue, once again enthralling the crowd by performing a selection of tunes with the help of 2 guest singers; including Sky Sanctuary, Sky Deck, E.G.G.M.A.N, and Believe In Myself, amongst others, before concluding on fan-favourite Escape from the City. And then it was all over, the day seemingly have blazed past once again, with the Retro group retiring to the pub. My personal thanks for another fantastic day to Rory, Adam, Svend, and all the rest of the crew – I eagerly await seeing what next year’s show brings.